“We need more oil!” isn’t usually the cue for a sell-off. But after Bloomberg News reported Tuesday morning that U.S. officials asked Saudi Arabia and some other OPEC members to bump up supply by about one million barrels a day – typically a demand that intimates some kind of shortage – futures prices fell about 2 percent, extending recent declines. If anything, the apparent specificity of the request is its most unusual feature and ought to be the most bullish. One million barrels a day is a lot, representing almost a third of OPEC’s spare capacity. If the U.S. government is looking for that much, it must be worried about not having enough. At this juncture, though, the same reasoning can also justify selling. 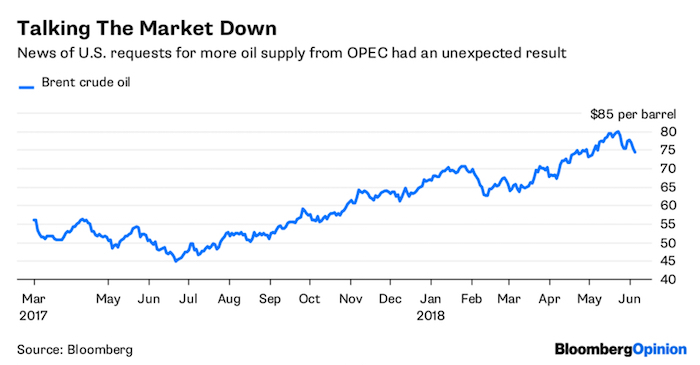 The obvious reason for U.S. officials to demand higher oil supply from OPEC in the middle of summer ahead of critical midterm elections is … well, obvious. 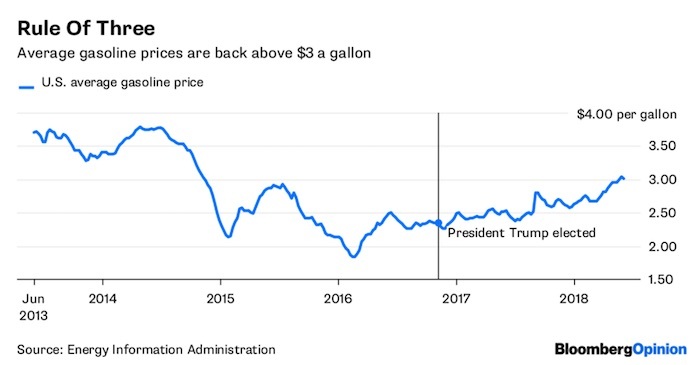 Average gasoline prices rose back above $3 a gallon in late May for the first time since November 2014. President Donald Trump signaled his displeasure already in late April, via the usual channel. Putting pressure on OPEC, and being seen to do so (with a big, headline-grabbing round number) is a no-brainer. For a president who prides himself on doing deals, this would be no more or less than a quid pro quo. After all, hasn’t he delivered in terms of socking it to Saudi Arabia’s great rival, Iran? Plus, he enacted new sanctions on Venezuela after last month’s elections, putting further pressure on a country whose collapse has been vital to OPEC’s effort to clear oil inventories. Lurking in there, however, is the nuance of timing. Actual disruption of Iranian oil flows remains uncertain, so the impact on summer pump prices is likely limited. With regards to Venezuela, it should be noted Washington still steered clear of direct sanctions on oil flows, which could spark a summer supply shock. As my colleague Julian Lee wrote here, OPEC and Russia are heading into what could be an exceptionally tricky meeting later this month. While oil inventories have dropped and prices have risen, the question now is what comes next as internal divisions on politics and prices re-emerge. Trump’s shot across the bow in late April, as well as Venezuela’s problems, also serve to highlight questions around how well demand would fare if prices spike in response to further supply disruptions. 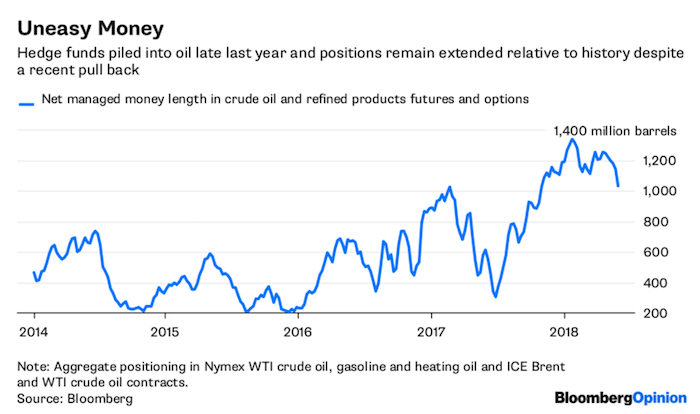 News of U.S. officials pressing for big supply increases – and with a strong motivation to keep doing so – raises the chances of OPEC & Co. announcing more supply, indulging in some infighting, or maybe both. And then there is the president himself, a big additional wildcard in an oil market that’s never been short of them. At the back of OPEC officials’ minds should be the Strategic Petroleum Reserve. Prior to Trump’s election, sales from the SPR have tended to be sparing and linked to definite emergencies, such as wars or hurricanes. Unleashing those barrels without a clear emergency would break with historical practice, given how it would roil the oil market (including domestic producers). But come on: Do you honestly think niceties like the sanctity of markets would necessarily stop a president who proposes effectively re-regulating America’s electricity sector and happens to think he can pardon himself? April’s presidential tweet and this latest news send a strong signal that, until November at least, $80-ish oil represents a ceiling on Trump’s patience (such as it is.) If OPEC doesn’t play ball, or prices rise for some other reason, then it can probably count on threatened use of the SPR to cap prices, and maybe even actual use. Certainly, nobody can discount it, or anything else, at this point. The political factors influencing the oil market this summer range between everything from Saudi-Russian-Iranian relations to the progress of the Mueller investigation.